The growing popularity of Peruvian cuisine throughout the world has made Lima, the capital of Peru, a destination city for food lovers. Virgilio Martinez is the most famous young chef in Peru. His restaurant Central, in Lima, is among the best in the world and he has opened two LIMA restaurants in the heart of London. 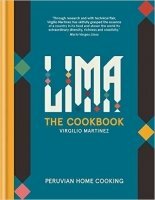 With this collection of more than 100 of Virgilio's fuss-free, contemporary recipes you can cook this fresh, vibrant, healthy food at home using your local fish, meat and vegetables - plus the superfoods for which Peruvian food is renowned.